Last night I made a cake for our Quilt group party tonight, utilizing July’s abundance of fresh berries. 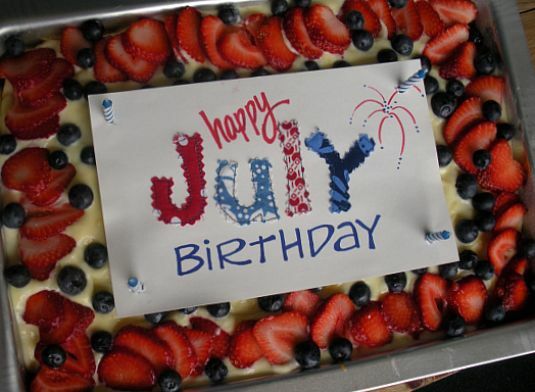 The card is a 5″ x 7″ index card with stitched fabric letters, “happy” and “birthday” written in red and blue Sharpie, and four candles holding it in place, one for each of us with a July birthday. 1) Prepare cake according to directions on box, adding Almond extract while mixing. Bake according to directions on box. Cool completely before adding topping. 2) Prepare pudding according to package directions, adding only 1.75 cups of milk. Add Almond extract after removing from stove, stirring in well. Cool pudding to room temperature, then Chill for 30 minutes. 3) Fold whipped topping into chilled pudding. Spread over cake. Top with berries and serve. This can be made as a layer cake, spreading pudding topping and berries between each layer. I have to travel with it this evening, so I used a 9″ x 13″ pan with a cover instead. Stay tuned, next week you might just get lucky with a birthday giveaway! My hubby is giving me a Very strange look…. is it becuase I'm licking my screen? LOL that cake looks and sounds absolutely YUM! My birthday is in July too, and I grew up with 2 friends who were born on the same day. It's a fun month to celebrate, though! Thanks for the recipe, I'll have to try it! Nice recipe, to be saved for baking on a day the air-conditioner isn't needed. Sorry I don't fit into your July birthdays crowd. Happy birthday to you, though! This looks quite tasty! I love these kinds of fruity desserts in summer cuz they don't feel so heavy. 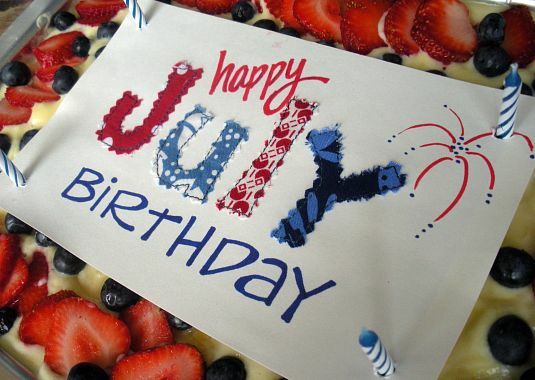 Happy birthday to all the July people out there!